What a difference staying away from the interstate can make. 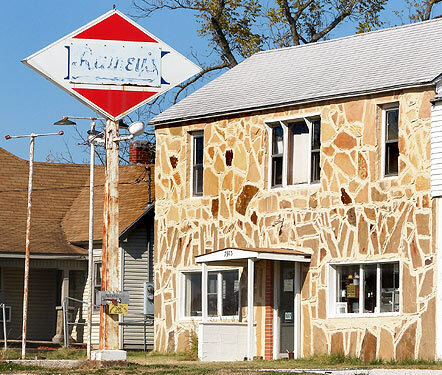 We had a busy weekend on the road, plagued by unreliable Internet access, but we did manage to shoot a few photos Sunday morning on a 13-mile stretch of Route 66 between Springfield and Halltown, Missouri. 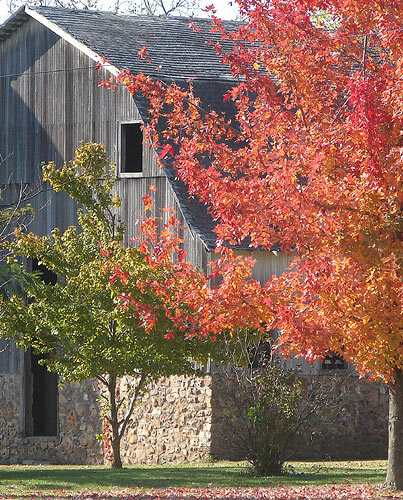 This barn belongs to a farm across from Agape Life Fellowship Church, 6185 West State Highway 266. This house was just four minutes west of there. 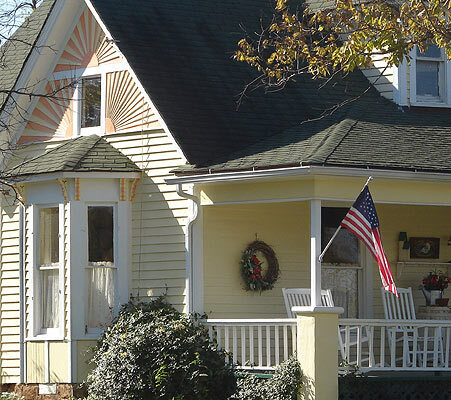 Check out the sunrise pattern in the siding. 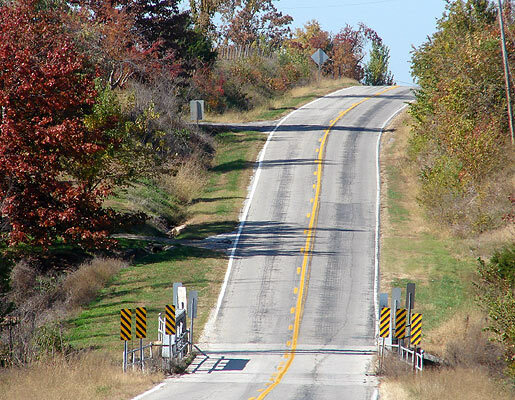 Rainey's Tow Service is just west of the intersection of Missouri Highway AB with West State Highway 266. I'm thinking that's an old DX sign. Route 66 is hilly and curvy in this area. This is further to the west, just past Hillside Baptist Church. There are so many churches along this part of the route that I find myself using them as landmarks. 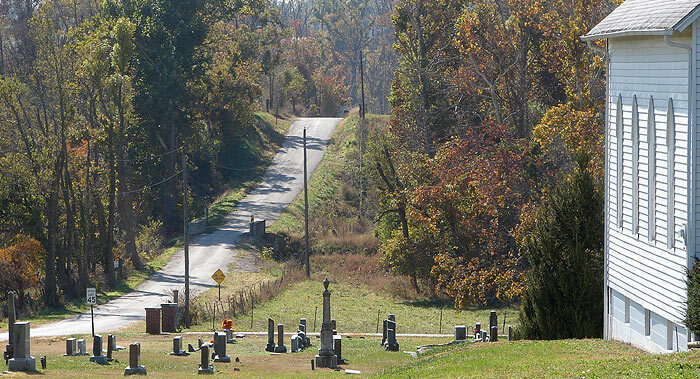 Yeakley Cemetery was established in 1852. The road from which I shot this photo would be designated Route 66 over 60 years later. 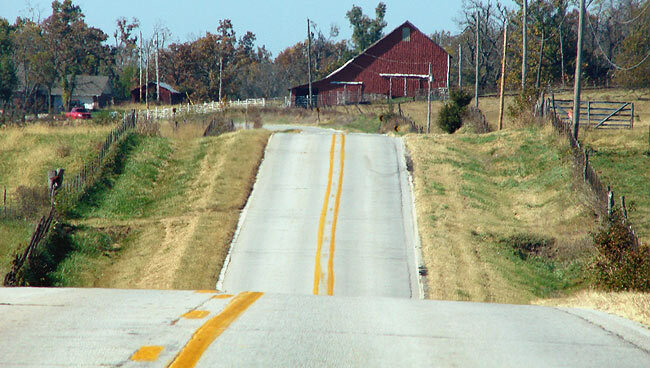 Now the road is called Missouri State Highway 266. That's Farm Road 65 stretching off to the south. The church wall seen to the right belongs to United Methodist Church, established in 1887. I shot this from the car. It is so much much less of a hassle to pull over on a typical old road than it is on an interstate - no buffeting of the car by gusts from passing trucks, you know. 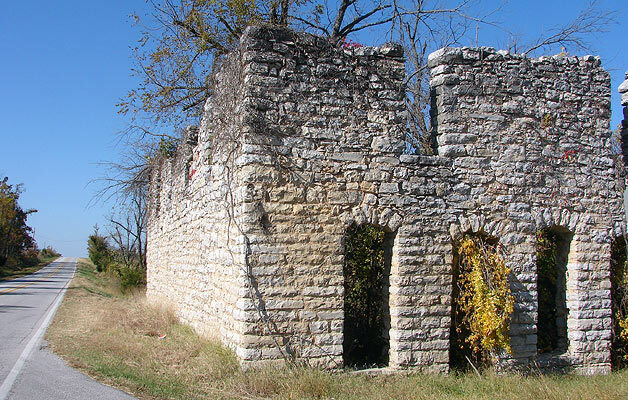 This long-abandoned stone structure is at Plano, Missouri, on the northwest corner of Missouri Highway 166 and South Farm Road 45. I shot a picture of it back in 1978 or so, and it was just a shell then. Man, what a nice little ruin this is for flights of fancy. This ribbon of road leading west out of Halltown is a background without a subject. I had a subject for it back in 2005, but the camera I had then wasn't nearly as good. I'd have loved to have waited for another horse and rider, but after this shot we had to switch over to I-44 due to a time constraint. However, even part of an hour on a beautiful old road furnished relaxation that lasted the day. What kind of camera do you use now? I probably could not afford one but curious just the same. The quality of your photography is second to none. JDP, I'm still using a Sony DSC-H2 - my fifth one. They keep breaking down and I keep getting them replaced on the Office Max extended warranty. Needless to say, I don't recommend the camera. It was $300, by the way. I'm looking now into the Olympus 550-UZ, but am not too impressed with anything on the market less than a DSLR, which would not be allowed in some places. Do We Really Want to Lose This?